[PDF] The Sublime in Modern Philosophy: Aesthetics, Ethics, and Nature | Free eBooks Download - EBOOKEE! 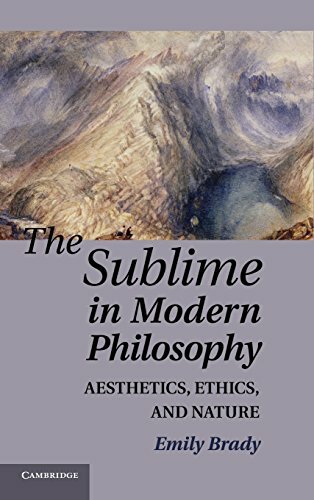 Description: In The Sublime in Modern Philosophy: Aesthetics, Ethics, and Nature, Emily Brady takes a fresh look at the sublime and shows why it endures as a meaningful concept in contemporary philosophy. In a reassessment of historical approaches, the first part of the book identifies the scope and value of the sublime in eighteenth-century philosophy (with a focus on Kant), nineteenth-century philosophy and Romanticism, and early wilderness aesthetics. The second part examines the sublime's contemporary significance through its relationship to the arts its position with respect to other aesthetic categories involving mixed or negative emotions, such as tragedy and its place in environmental aesthetics and ethics. Far from being an outmoded concept, Brady argues that the sublime is a distinctive aesthetic category which reveals an important, if sometimes challenging, aesthetic-moral relationship with the natural world. No comments for "[PDF] The Sublime in Modern Philosophy: Aesthetics, Ethics, and Nature".